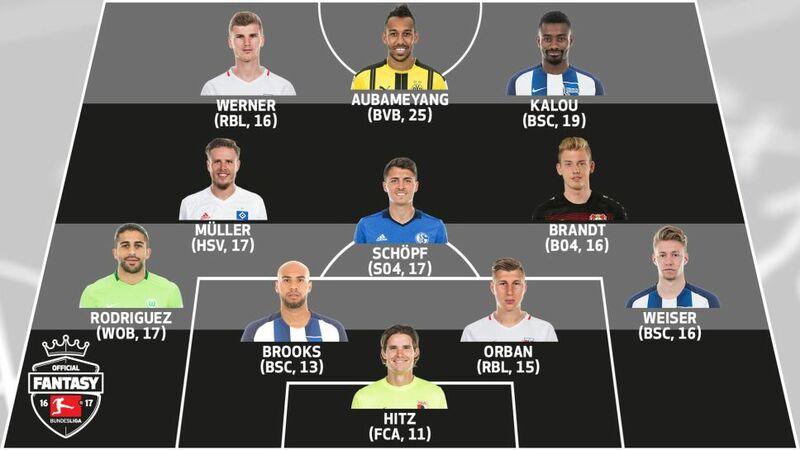 Hertha Berlin were the best-represented team in Matchday 10's Official Fantasy Bundeasliga team of the week, with three players. If you made Pierre-Emerick Aubameyang your captain you were laughing all the way to the Official Fantasy Bundesliga bank on Matchday 10, but who racked up enough points to earn a place in the #BLFantasy Team of the Week? Timo Werner (RB Leipzig, 16pts) - Werner just pipped team-mate Emil Forsberg to the post in terms of fantasy points after scoring twice and assisting the Swede's goal in Leipzig's defeat of Mainz. Watch: Timo Werner and Emil Forsberg on Leipzig's superb start to the season. Pierre-Emerick Aubameyang (Borussia Dortmund, 25pts) - Aubameyang moved joint-top of the Bundesliga goalscoring charts after scoring four goals in BVB's 5-2 win in Hamburg. Throw an assist into the mix and he racked up a points tally only matched by Weiser on Matchday 3. Salomon Kalou (Hertha Berlin, 19pts) - Making only his second appearance of the season, Kalou scored all three goals in Hertha's win over Gladbach with just three shots on goal!